What kinds of problems can Kris address with an assessment? Almost any observable problem related to employee performance and morale should start with a thorough assessment. Example problems could be low scores on customer service, a drop in market share, high employee turnover in a particular department, an unresolved conflict between employees or units, or decreased morale on a team. Ever get so entrenched in a problem that you can't see the forest through the trees? That's where an outside consultant is a great resource. Kristin can help you ask the right questions to define your current problem, identify your desired measurable outcomes, find causes, and eliminate causes through effective solution implementation. One particular role in an organization is experiencing high turnover. After the fourth hire in five years, it is time to assess the problem. A department consistently misses monthly performance benchmarks. The VP is getting vague, informal opinions about the causes of the problem. Everyone is finger-pointing and protecting turf. The VP doesn't know who to believe and wants to take a systematic approach to solving the problem. What value do Kristin's assessment services offer beyond what we can do on our own? Assessment involves finding cause. Sometimes people are afraid that finding cause means "placing blame." When left to find cause on their own, leaders sometimes run up against understandably defensive behavior. The right questions don't get asked. The political games begin. Kristin's style turns assessment into a productive pursuit for improvement, rather than a witch hunt. Kristin's singular goal is to help the organization improve its productivity and morale. Since Kristin has no authority in the organization's structure and is not seeking in-house employment, her inquiries and problem-solving pursuits are less threatening. It is much easier to cooperate and be candid with a person who can't sign your pink slip! 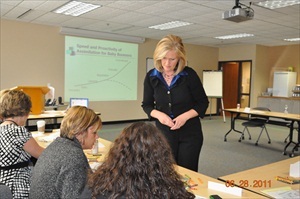 Kristin has developed her facilitation skills with a variety of organizations over the last 20 years. With post-graduate studies in problem solving and group facilitation techniques, Kristin can help your group quickly gather and analyze information. Kristin carries a heavy toolbox loaded with formal ways to facilitate problem solving in groups. Her approach is unthreatening, constructive, and organized. Do you have existing employee and customer surveys? Do you ever question their reliability and validity? How do you know the survey is measuring what you really want to know? Although data analysis can be a dry, complicated subject, it is extremely important in problem solving. Kristin's background in statistics and quantitative study gives her an edge in analyzing data. Let's not over-react to jumps in our measures until we understand significance, sample size, reliability, and validity. On the flip side, let's make sure we react to changes in measures that are tried and true. "Once a client called me because a score on a standard employee satisfaction survey triggered a system warning about one of his department supervisors. When we dove into the wording of the questions, sample size, margin of error, and recent changes to this department, we discovered there were many other causes for the numeric "warning" besides leader competence issues. A quick meeting to analyze data halted a possible knee-jerk, disciplinary reaction to numbers on a page. The result was a much more collaborative approach to addressing causes of organizational problems that were evidenced as symptoms on a survey."